Home crowd support, ready for the challenge, Ding Ning and Zhu Yuling won the Women’s Doubles title at the Seamaster 2018 ITTF World Tour Platinum Kaisa China Open in Shenzhen on Sunday 3rd June. The no.5 seeds, they beat Korea Republic’s Jeon Jihee and Yang Haeun, the no.3 seeds, at the final hurdle (11-9, 11-5, 4-11, 11-5) to arrest the title. No strangers to each other but in the opening game finding a rhythm to their play, establishing a lead that would relax nerves was the problem for both pairs. However, at the crucial stage, scores level at 9-all, Ding Ning and Zhu Yuling held the ace card. Simply they followed the tried and trusted policy of take no risks, keep the ball on the table, trust your techniques and the chances are you will succeed; the theory worked. The policy continued to work in the second game, Ding Ning and Zhu Yuling were always the favourites in the rallies; they established an 8-4 lead; they surrendered just one more point. Any hesitancy that may have been prevalent in the opening games had vanished into the Shenzhen evening air; not only from Ding Ning and Zhu Yuling but also from Jeon Jihee and Yang Haeun. They were in a “nothing to lose” situation and playing in a more relaxed manner moved ahead 6-2 in the third game; a gap they never surrendered. Stung by the reverse, accelerating the speed of the play, Ding Ning and Zhu Yuling asserted a 4-1 advantage in the fourth game, the Korean duo called “Time Out”. However, the momentum was with the host nation duo; at 10-2, Ding Ning and Zhu Yuling held eight game points. Jeon Jihee and Yang Haeun secured the next three, Ding Ning and Zhu Yuling called “Time Out”, the break worked the title was clinched. 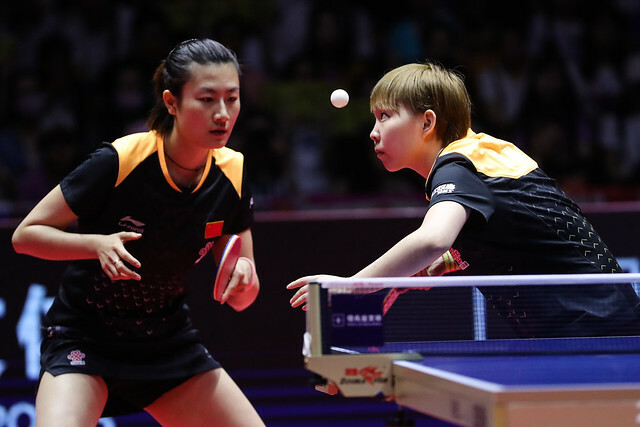 Success for Ding Ning and Zhu Yuling, as a partnership it was only their third appearance in an ITTF World Tour Women’s Doubles final; it was their third success. In 2015, they had won in both Kuwait and in Warsaw; in the former beating Singapore’s Feng Tianwei and Yu Mengyu in the final; in the latter Germany’s Han Ying and Irene Ivancan. Meanwhile for Jeon Jihee it was their 16th such final, the ninth time in runners up spot.